We can use bird monitoring to show that bird diversity and numbers ( species richness and abundance) have increased at the site overall, as a result of the revegetation and regeneration of a diverse suite of native plant species. This will be easy to show, as we can graph the increase in bird species and occurrence over time, as the plantation grows. The first bird seen using the south site was the Yellow-faced Honeyeater, Lichenostomus chrysops (pictured) in October 2011. A common honeyeater in the area, it has been observed on most of the group’s surveys. A flock of about eight birds were foraging on the healthy young blue gum seedlings, which are about waist height. The honeyeaters would forage for a while, then back to the nearby remnant, then return to the open area to feed again on the insects in the young trees. On the June 2013 survey, a number of birds were observed foraging on the wattles and young eucalypts in the South ImLal site: namely, Brown Thornbill, Grey Shrike-thrush, Superb Fairy-wren and Grey Fantail. Birds have been seen in the biorich plantation at every survey since. We have now carried out over 25 surveys on the site, which are held on a seasonal basis, with over 80 species having been observed. Surveys are led by ornithologist Dr Grant Palmer a Senior Lecturer in the Centre for Environmental Management at Federation University, Ballarat. His write-up of the latest autumn survey 2016 follows. Grant Palmer (on left) Phil Kinghorn and Louise Humble. ​The autumn bird walk was greeted with sunny skies and pleasant conditions which quickly turned to overcast skies and gusting wind as the count started – which unfortunately meant a distinct lull in bird activity through the first section, just a few Australian Magpies and a distant calling Grey Shrike-thrush. The bird count started proper with a small flock of 6 Yellow-tailed Black Cockatoos flying lazily overhead, emitting their very distinctive calls as they headed into the Lal Lal State Forest. Rounding the western edge of the first lot of revegetation, we were lucky enough to stumble upon a mixed species foraging flock, a typical phenomenon at this time of year in southern Australia. Mixed species foraging (MSF) flocks include a range of a nuclear and attendant species which take part to gain advantages such as increased foraging efficiency or reducing predation risk. By foraging in groups birds can take advantage of prey flushed by other individuals or avoid areas where food has already been depleted. By having more pairs of eyes, there is more chance of detecting potential predators also. The MSF we had the pleasure of observing included many Yellow-faced Honeyeaters and New Holland Honeyeaters, a White-eared Honeyeater, a few Brown-headed Honeyeaters and White-naped Honeyeaters and Silvereyes all working through flowering Swamp Gum in the planted section, with Brown Thornbills and Superb Fairywrens working the lowest levels, a Spotted Pardalote pipping in the foliage, and a Golden Whistler was also lurking in the inner foliage. A Grey Shrike-thrush and Grey Fantail were also clearly associating with this group. Watching this group of birds over a number of minutes provided a real highlight for the day. The large dam supported unprecedented numbers of Australian Wood Duck – conservatively counted at 120-odd individuals – which were spread between the bank or on open water. Other waterbirds included several Pacific Black Duck, a lone Grey Teal, some Eurasian Coots, a pair of Hoary-headed Grebes and a lone Little Pied Cormorant. A pair of Masked Lapwing stood motionless on the shoreline, while a Swamp Harrier soared lazily overhead. A second pass of the dam later uncovered a dozen or so Australian Shelducks which had made their way on to the water. The dreaded gorse on the western boundary housed a rare treat, a pair of Striated Fieldwrens, which kept close to the prickly cover as they foraged, making the most of a brief patch of sun. There was also a small flock of Red-browed Finch feeding on the ground in the vicinity. The swamp gums on the far side of the dam were a mass of Red Wattlebirds – their aggressive nature either driving other nectarivores out of the patch (most likely), or their constant harsh calling was drowning out all other calls. There was in excess of a hundred birds recorded in the patch. They were clearly making the most of the copious swamp gum flowers and nectar. There were also some Crimson Rosellas, mostly immatures, in this patch too. The remnant patches of swamp gum in the back paddock produced good views of a pair of Eastern Rosellas, and a lone Noisy Miner (the miners are always present but in recent times numbers have always been very low). Striated Pardalotes were constantly calling from the canopy. Out in the more open areas, a few Australian Magpies moved around, while a Common Blackbird called from dense understorey along the boundary. It wasn’t until we moved through the relatively large patch of remnant large old swamp gums on the eastern side that we observed the first laughing Kookaburra of the day. This patch was rather quiet as the now howling wind put a stopper on bird activity. Amongst gusts, a few striated Thornbills could be heard calling in the canopy. All up, the bird species count was 30 species for the morning, with the MSF providing the highlight. Swampy paddock to the west of ImLalSouth. The fixed route monitoring method, developed by BirdLife Australia, was selected by the bird survey leader Tanya Loos to measure the long term changes in bird diversity and numbers at the ImLal site. This method is particularly suitable for picking up location specific changes over time. The fixed route monitoring method will allow us to say definitively in five or ten years whether or not the species diversity and numbers of birds have increased at the site overall since the outset of the project. To keep it simple, and easy to replicate over a long period of time, we have kept the survey design to one long survey (two hours) that moves through the site at a steady pace and always along the same route, with the same stopping points, see pdf of the route map. Participants have also expressed a desire to capture when we see the bush birds leave the swamp gum remnants that surround the plantation sites, and actually forage within the plantation. Habitat usage – such as observations of Yellow-faced Honeyeaters, and other birds such as Brown Thornbills foraging in plantation regrowth is difficult to assess statistically when we only have one small site. Statistically meaningful data relies upon the study design having many sites – ideally 30 to over 100, and with some control sites, and randomness in there as well. Each of the two plantations is roughly 5ha, so a way around this problem could be to carry out a standard 5ha bird search on each planting, ignoring birds in the swamp gum remnants and focusing solely in the adjoining ‘paddocks.’ This could be done two to four times a year, and would be a way to capture the changes in habitat as the plantations grow, as well as use of the plantations by the local bird population. The most commonly observed species on site to date have been Australian Magpie, Crimson Rosella, Eastern Rosella, Grey Teal and the Noisy Miner, which have been observed at 7-8 surveys. A pdf of the Bird List species observed at the ImLal site as at 30 June 2013 is attached here. The Grey Teal is part of our waterbirds contingent that may be observed on or near the two dams on the site – Australian Wood Duck, Chestnut Teal and Hardhead make up the duck species. White-faced Heron are regularly observed as well a single sighting of a Pacific Heron. Both species of Ibis also occur on site – largely due to the inundated paddock next door. Australian Magpie is an open country bird. We could also put seed eaters such as Galah and Eastern Rosella in this group, and the aerial insectivore Welcome Swallow. Australasian Pipit, Yellow-rumped Thornbill, and Willie Wagtail are also typical species of the open country and it is no surprise to see them in the mix of paddock and remnant swamp gums at ImLal. What is fascinating at the Imlal site is that although we saw Noisy Miners during all the surveys through to 2013, by the end of that year the Noisy Miner colony in the remnant at the centre of the biorich site seemed to have inexplicably vanished. In early surveys, we never saw more than 7-10 birds and we did not observe a total exclusion of other birds from the remnant patches in the middle and north of the site that the Miners occupy (see below for more on the Noisy Miner). In these remnant patches, we regularly observe forest and woodland insectivores that are usually excluded by Miners – species such as Spotted and Striated Pardalote, Striated and Brown Thornbill, Grey Fantail and honeyeaters such as White-naped, White-eared and Yellow-faced Honeyeater. The ImLal site is located on the border of the Victorian Volcanic Plain and the Central Victorian Uplands Bioregion and many of the species listed above, especially the White-eared Honeyeater, are associated with forests rather than woodlands. Other forest species such as Scarlet Robin, Pied Currawong and Yellow-tailed Black Cockatoo have also been observed at ImLal. Pictured is a White-eared Honeyeater Lichenostomus leucotis; a bird usually associated with forests, but seen regularly in the swamp gum woodland remnants. One starling and a few blackbirds are the only exotic bird species have been observed at ImLal to date. The presence of the Noisy Miner on site presents an interesting problem. The Noisy Miner, Manorina melanocephala, is a hyper aggressive, colonial honeyeater associated with remnant woodlands. A native honeyeater, it should not to be confused with the introduced Indian or Common Myna. Lerps are sugary coated houses for tiny sap sucking insects called psyllids. Many birds relish this sugary coating, and eat the insect and the coating at the same time for a carbohydrate and protein packed meal. The Noisy Miners, however, carefully eat the coating and leave the insect behind. What’s more, they work very hard to exclude any birds from their territory that may harm the psyllids. Psyllid farming benefits the Noisy Miners, but has a significantly negative impact on the health of the forest or woodland, as the psyllids and other insects are protected from their usual predators and so their populations can increase exponentially. When Noisy Miners are removed from a patch (usually by shooting), small woodland birds such as Pardalotes and Thornbills will rapidly recolonise the Miner’s territory, sometimes within hours. 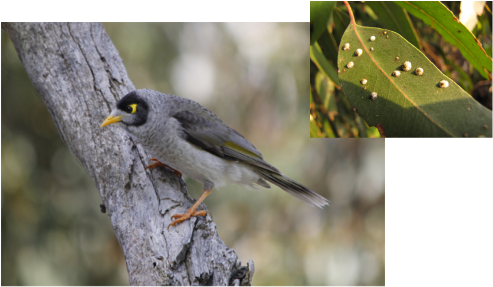 Revegetation design and remnant management may have significant impacts on the success and spread of Noisy Miner colonies. The challenge at ImLal is to ensure that that the establishment of the two plantations hinders rather than helps this notorious honeyeater – and that the monitoring program can capture this. Steve Murphy’s careful observation and the onsite creation of the many layered structure of natural woodlands should ensure that the Noisy Miners are not advantaged. Like many of our smaller, insect eating bush birds, the Striated Pardalote, Pardalotus striatus, contributes significantly to Eucalypt health by eating sap sucking insects such as psyllids. At ImLal, the colony appears to be very small, and restricted to the remnants in the north and middle of the site. Insectivore and other small bird exclusion appears not to be happening. Many questions are raised: to start with, these birds may occur in colonies of up to 200 individuals, but here at ImLal we have never seen more than 10 – why are the Noisy Miner numbers comparatively low? Do Noisy Miners occur in other sites nearby? Are they breeding? Is there a lot of aggression towards other birds occurring? To date, we have observed just two incidences: one Noisy Miner chasing a Red Wattlebird, which is a large and aggressive honeyeater in its own right; and, secondly, a Noisy Miner chasing a Laughing Kookaburra. Are the low numbers of Noisy Miners because the bird community is more of a forest than a woodland bird community? By 2014, the Noisy Miner colony in the remnant at the centre of the biorich site seemed to have disappeared. Whether this us temporary or not it's too early to be determined. The questions raised by the establishment of the two biorich plantation sites are many. The careful management of Noisy Miners involves ensuring that revegetation sites discourage rather than encourage the colonies. This includes ensuring that there are not peninsulas and clumps of eucalypts protruding from the main remnant area, smoothing out any sharp edges, as well as the establishment of a structurally complex ground layer vegetation. The plantations have a mix of eucalypts, shrub and ground layer flora, and the natural regeneration sites presumably will have also this mix. The remnant swamp gum woodlands, where the Miners are present has been grazed by a herd of about a dozen cows, creating a habitat that is ideal for Noisy Miners. Will the Miners be discouraged from the remnants if we plant shrubs, such as Tree Violet, and a suite of wattle species in the remnants? 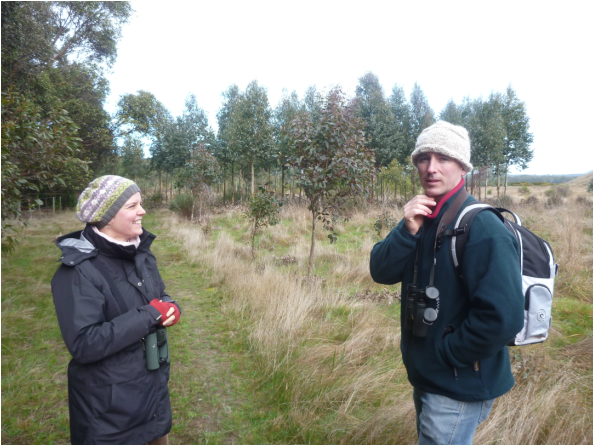 New bird survey leader, Grant Palmer, (right) a research fellow at Federation University, with Tanya Loos on the 20th bird survey. 2) Capture the data required to demonstrate that the plantations are not encouraging the Noisy Miners, so that we can make recommendations for those establishing similar projects in other Noisy Miner areas. This is very much a preliminary report which raises more questions than it answers. The author will be enlisting the advice and assistance of a number of workers in the Noisy Miner/ Revegetation and Plantation field to check the survey methodology and design. Stay tuned for the follow-up. Gib Wettenhall through the Contact menu.